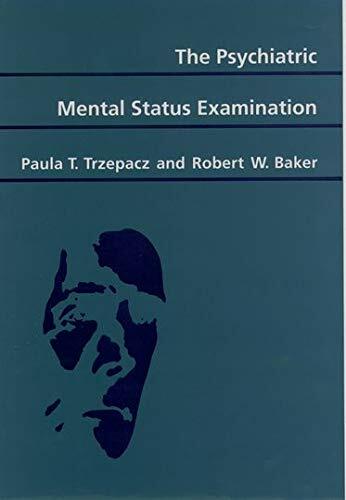 Developed from years of teaching psychiatry to medical students and residents, this comprehensive text devoted solely to describing the mental status examination (MSE) fills a void in the teaching literature and will be valuable to both students first learning about the MSE and seasoned clinicians seeking an informative reference. The introductory chapter offers basic advice on interviewing patients and eliciting information. Six major sections of the MSE follow and are thoroughly described with a chapter devoted to each: Appearance, Attitude, Activity; Mood and Affect; Speech and Language; Thought Content, Thought Process, and Perception; Cognition; and Insight and Judgment. Each chapter lists a detailed definition of reference for students describing their findings, and are an insightful review even for experienced practitioners. The clinical relevance of mental status abnormalities is illustrated through frequent examples of disorders that can cause the particular signs and symptoms defined in each chapter. A final chapter describing fictional case histories with hypothetical examples of written mental status reports will be particularly useful for those learning to write such reports. This text is an important addition to the libraries of students and practitioners who work with psychiatric patients and should help to simplify and organize a challenging task. Paula Trzepacz and Robert W. Baker are both at the University of Pittsburgh.